» NHL Grab Bag: Is Ovechkin’s Bracket Busted Yet? Welcome to a weekly grab bag of thoughts and observations from the past few days and/or decades of hockey. Recognizing the three NHL personalities from around the league who produced the most comedic fodder for fans. Ovechkin tried to fill out a March Madness bracket. It, uh, didn’t go well. I especially liked the part where he listed Iowa State as “Lowa State.” And do you know why he did that? BECAUSE HE’S A HOCKEY PLAYER AND DOESN’T RECOGNIZE THE LETTER “I.” Not like those glory boys from other sports. LeBron James spells “Iowa” with 18 I’s. It’s true. I saw it on Facebook. Hey Phil, how’s the playoff push going for the Maple Leafs? Phil Kessel GIFs are the Internet’s greatest GIFs. Earlier this week, I posted a St. Patrick’s Day–inspired list of the 10 greatest NHL moments from players named Pat or Patrick. But despite being one of the most heavily hyped draft prospects of the 1990s, Pat Falloon did not make the list. So we’re going to talk about him here. The San Jose Sharks joined the NHL as an expansion team (sort of — it was complicated) in 1991. You might think that would entitle them to the first-overall pick in that year’s draft. After all, when the Senators and Lightning joined the following season, they were given that year’s top picks. But 1991 wasn’t just any year; it was the Eric Lindros draft. And Lindros was considered the biggest sure thing the league had seen since Mario Lemieux. So the league left the Lindros pick for the established teams and gave the Sharks the no. 2 pick instead. The Nordiques ended up taking Lindros first overall, so the Sharks took the next-best forward prospect: Falloon, a junior sensation who was coming off back-to-back 60-goal seasons in the WHL. Falloon posted a decent rookie year, scoring 59 points and finishing fourth in Calder balloting. But he’d never reach that level of offensive output again, spending the next nine years bouncing around five different teams before being out of the NHL for good by 2000. He’s now remembered as one of the league’s top draft busts, making it fitting that he was once traded for Alexandre Daigle. In case you were wondering, the player picked immediately after Falloon was another WHL star: a defenseman named Scott Niedermayer, who went to the Devils third overall. Niedermayer was inducted into the Hall of Fame last year. Peter Forsberg was taken a few picks later. Pat Falloon’s other claim to fame is that fans sometimes called him “Fat Balloon.” He wasn’t actually fat, but man, that is one devastating nickname. 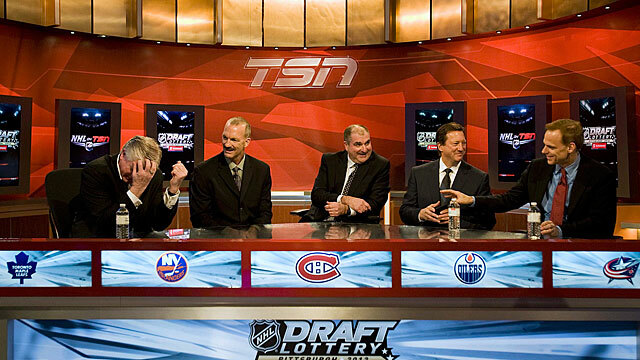 This Week’s Debate: The NHL is considering changing the way the draft lottery works. The new system would allow teams that finish last to fall multiple spots, instead of being assured a top-two pick like they are today, and would be meant to discourage tanking. Is this a good idea? In Favor: Yes, it is. A league’s competitive integrity is crucial, and even the appearance of tanking is a major problem. Opposed: Maybe, but is there any evidence that tanking is really an issue? Watch any last-place team’s games. The players still seem to be working hard. In Favor: Oh, sure. Players don’t tank, because their jobs are on the line. The bigger issue is that organizations give up on seasons and don’t try to ice the best possible roster. They unload all their talented veterans, keep the payroll nice and low, and refuse to bring in any players who could actually help them win, all in the hopes of landing a top pick. Opposed: Nice theory, but do teams actually do that? In Favor: Look at this year’s Sabres. They’re clearly making no effort not to finish dead last. Opposed: Maybe not, but what do you want them to do? It’s been obvious since late October that they weren’t making the playoffs, so they’re looking ahead to the future. That’s not tanking, that’s rebuilding. In Favor: And that’s the problem. Under the current system, tanking and rebuilding are basically the same thing for some teams. Imagine being a Sabres fan this year, not to mention next year. What would you be thinking watching these guys? Opposed: I’d be thinking, Man, I’m pretty pumped for the Samuel Bennett and Connor McDavid era, that’s going to be awesome. In Favor: Right. So as a fan, you’d be hoping your own team would lose. You don’t see a problem with that? Opposed: Well … yeah, when you put it like that, I guess I would. In Favor: That’s the issue. Pro sports is a complicated business these days, but at its heart it still needs to be about winning and losing. If losing ever starts to seem like a good idea, you’ve got a huge problem and you need to find a way to fix it. Opposed: You’re right. That’s a great point. In Favor: Uh … thanks. So the NHL should move toward a system that discourages tanking. In Favor: Um … you’re not arguing with me anymore. Opposed: No, I am not. In Favor: Wait … are you … are you tanking this debate? Opposed: I cannot confirm or deny. In Favor: Oh, great, now the rest of this is going to be completely unreadable. In Favor: Come on, at least put up a little effort. In Favor: So what, you’re just going to spend the rest of this debate saying the dumbest things imaginable in order to intentionally lose? Opposed: I enjoy the shootout and am in favor of the loser point. In Favor: You’re embarrassing yourself. Opposed: All part of the rebuild. The Final Verdict: With the first overall pick in the Great Hockey Debates rhetorical devices draft, Opposed is pleased to select … Scesis Onomaton. In Favor is on the clock. In Favor: Sigh. Was it worth it? Opposed: It was totally, absolutely, completely worth it. In which we attempt to enter a new word or phrase into the hockey lexicon. Schrödinger’s puck (n) — The moment when a shot-directed goal hits the side of the net in such a way that exactly half the crowd, depending on the viewing angle from where they’re sitting, will think it has gone in. For a brief instant, the puck exists in a superposition of states, both inside the net and out. This results in the crowd making a really weird noise. This spot is typically reserved for annoyances that have been around forever, and in some cases may even be getting worse. But every now and then, I’d like to use it to highlight an annoyance that maybe, just maybe, could be starting to fade away. So this week, let’s revisit an issue we’ve covered in the past: the way a typical NHL injury report has been rendered useless by the insistence on categorizing every injury as either “upper body” or “lower body,” thanks to the paranoid belief that any further information would result in players being targeted by opponents. The trend is dumb and annoying, and over the years there hasn’t seemed to be any sign of it going away. May the hockey gods bless you, Joe Sakic and Patrick Roy. Even if this doesn’t last, you’ve given us a glimmer of hope for the future. In addition to being a great source of adorable pets and functionally illiterate commenters, YouTube is a gold mine for old hockey clips. Each week we find one and break it down in way too much detail. Monday was St. Patrick’s Day, and, in addition to giving teams a chance to sell crappy green merchandise, the day also marked the 23rd anniversary of one of the most memorable moments in the long history of the Blues-Blackhawks rivalry. So for today’s YouTube breakdown, let’s head back to March 17, 1991. There’s just two weeks left in the regular season, and Chicago is playing host to St. Louis in the back half of a home-and-home that will help decide the winner of the Presidents’ Trophy. The first game was a rough one. The second is about to get worse. Make some popcorn and gather the children. It’s time to revisit the St. Patrick’s Day Massacre. • You may be wondering why these two teams hate each other and keep trying to fight all the time, so let me give you the extensive background: They’re in the Norris Division. Great, glad everyone is up to speed. • Our clip begins with each team having eight or nine players on the ice, which can’t be a good sign. Chicago’s Steve Larmer has just been given a five-minute major, and the two teams are in the middle of changing lines when the trouble starts. 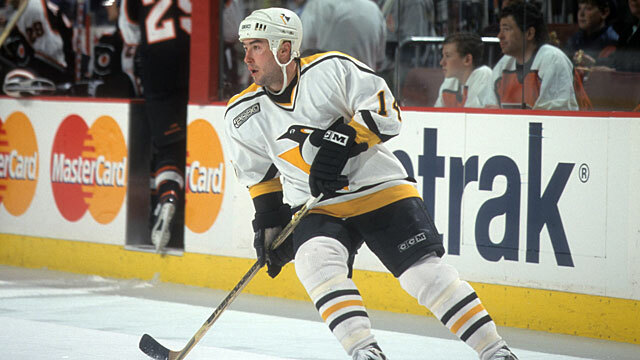 • There had already been bad blood in this game, including a line brawl that saw Blues tough guy Darin Kimble manhandle Jeremy Roenick (see the 2:30 mark in this clip). The Blackhawks were furious, accusing Blues coach Brian Sutter of sending Kimble over the boards specifically to pummel Roenick. • Back to our clip. One version of the story says the Blues sent out their usual power-play unit, only to realize the Blackhawks had sent out the goon squad. That left the Blues skills players outnumbered and, in the words of Adam Oates, “terrified.” Terrified is bad, right? • Pro tip: Every time you hear an early-1990s hockey announcer use the phrase “milling about,” something horrible is about to happen. • But despite how Chicago is obviously looking for trouble, the officials are actually doing a good job of keeping everything under control, so as long as nobody from St. Louis decides to randomly cross-check someone we should be just fine and … oh, hello, Scott Stevens, didn’t see you there. • And with that, we’re off to the races, assuming the race is to see who can punch people the fastest. The first guy to get to Stevens is Hawks winger Steve “Stumpy” Thomas, who is comfortable with this sort of violence because he was in Youngblood. • Keep an eye on Chicago’s no. 3 at the 0:40 mark. That’s Dave “Charlie” Manson, and he executes the “suddenly skate backward away from the brawl” move. Pro tip no. 2: When you see a tough guy pull this move, run, because he’s about to do something crazy. And that goes double if it’s a guy who once tried to sunset flip a linesman. • Manson eventually locates his target: It’s Stevens, and there’s a history here. The two players had fought the previous season, and wound up serving suspensions for biting and eye-gouging. I did not make that up. • It’s a pretty darn good scrap, and they keep throwing even after they hit the ice. Eventually the linesmen dive in and break it up. This fight helped earn both guys a spot on Don Cherry’s all-time tough team, so I’m going to go ahead and say it was all worth it. • Meanwhile, referee Bill McCreary is trying to break up a tussle between Chicago’s Stu Grimson and, uh, Chicago’s Keith Brown. Blackhawks, you are doing this wrong. • Steven heads to the penalty box bleeding from the eye, either because he’s cut or because a time traveler from the future just showed him what the NHL rulebook on head shots would look like in 2014. • Can we just recognize Pat Jablonski’s work here in the role of “goalie who just calmly stands there as if nothing is happening while everyone fights around him”? That’s a crucial but underrated role in any good line brawl. I don’t think I’d be good at that. I’d probably spend a lot of time crying and yelling, “Why are Mommy and Daddy fighting?” at the referee. • “Stevens getting everything he deserved.” And with that, we can all go ahead and cross off the “ridiculous homer announcer comment” square on our hockey-fight bingo card. • And now we get a shot of the two coaches, Mike Keenan and Brian Sutter, having a pleasant chat over by the benches. No, really, they’re downright cordial. In fact, this may be the calmest I have ever seen Mike Keenan. I’m kind of worried right now, you guys. Can we go back to people punching each other? • Oh, good, here’s Glen Featherstone and Mike Peluso to restore the natural order of things. Note how Keith Brown just casually watches from a few feet away, which would bring back memories of this fight from earlier in the season, except I doubt Peluso has any memories from that one. Seriously, don’t fight Wendel Clark, kids. • Is there a Sports Emmy for “foreboding shot of abandoned hockey gloves on ice”? There should be. • And that’s basically the end of things. It was pretty intense. Luckily, we get several shots of the Blues bench, so we can all spend a few minutes focusing on that one guy’s sweater to calm ourselves. The two teams ended up raking up 278 PIM in the game, which led to an NHL investigation. The league ended up handing down 22 games’ worth of suspensions, including 10 each to Peluso and Chase, and more than $28,000 in fines, most of which went to whoever made that sweater.